Maybe a better title for this post would be “Eclipse Debugging with Strings Attached’? Digging a bit more into the domain of string debugging, things are not always the way I wish they are. Here, instead of the string, only the address of the first character is shown in the preview pane. Actually the same is happening for the ‘p’ pointer as well. 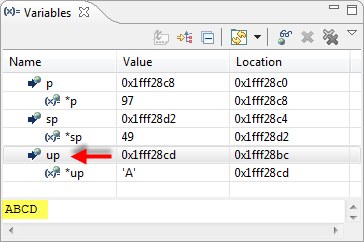 Eclipse only shows strings for ‘unsigned char’ types. Or if plain char is unsigned. Better, but still not showing it as a string in the variable preview pane :-(. So it looks that bug is fixed in Eclipse 3.7 :-). The result is the same for Eclipse 3.6 and 3.7, and I have not found a way to cast the arrays neither. 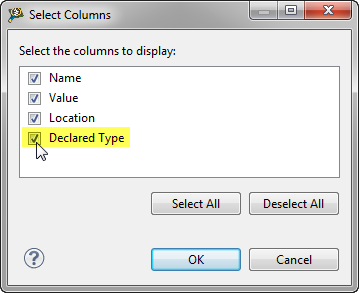 So this feature is definitely missing in Eclipse for me. 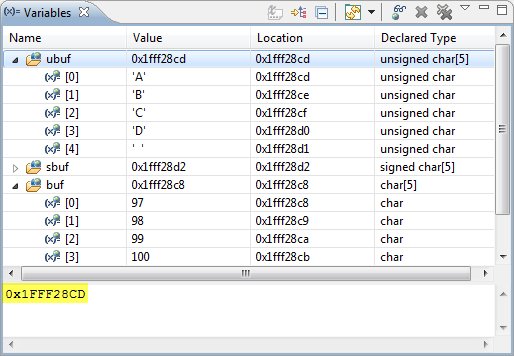 In Eclipse 3.6 (CodeWarrior for MCU10.2) only unsigned character pointers are shown as strings in the variable preview. 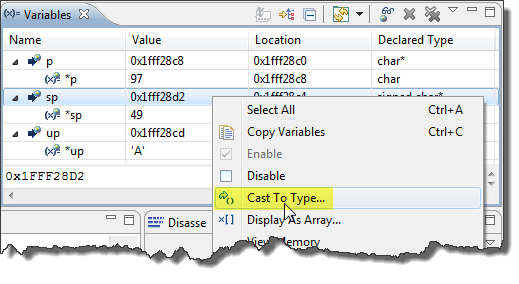 Casting signed character pointers only works in the next Eclipse 3.7 version. Unfortunately arrays are not displayed as strings, which in my view is a step back from the classic non-Eclipse CodeWarrior version. At least unsigned character arrays should be displayed as strings. As a side comment, this adds to my rule of thumb to use ‘unsigned char’ for strings, and not to use plain char: depending on the architecture and the compiler, plain char might be handled differently. Using plain char makes porting more difficult, and not using unsigned char might impact debugging. This entry was posted in Classic, CodeWarrior, Debugging, Eclipse, Embedded, Kinetis, Tips & Tricks and tagged CodeWarrior, Debugging, Eclipse, Tips&Tricks by Erich Styger. Bookmark the permalink. Thanks SO much for this! It’s been driving me crazy. 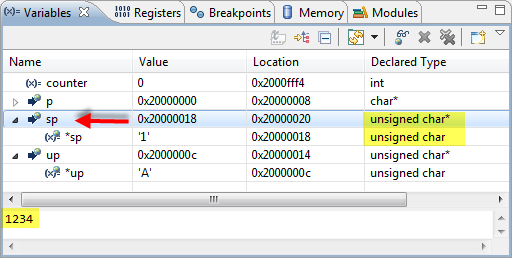 If you find a way of display as a hex dump (instead of view memory, which is quite laborious and bleugh), please post. 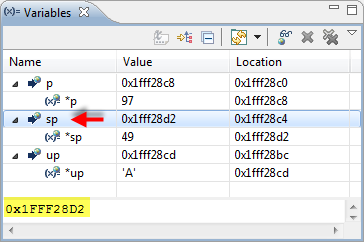 You can show it as an array in the Variables view, with the format set to hexadecimal.